In recent years the demand for luxury high-rise development in Las Vegas increased significantly, and developers reacted accordingly by creating luxury masterpieces such as Cosmopolitan, Signature at MGM, Allure and etc. In the past 10 years, more than 20 luxury condos were built and presently, there are more under construction. The increased demand from buyers, renters, and investors alike coupled with relatively low acquisitions costs, has created a unique opportunity in our market. Whether your prefer a spectacular Strip view from your balcony, the lush greenery of a golf course view or a sophisticated lake front condominium, Las Vegas has it all. 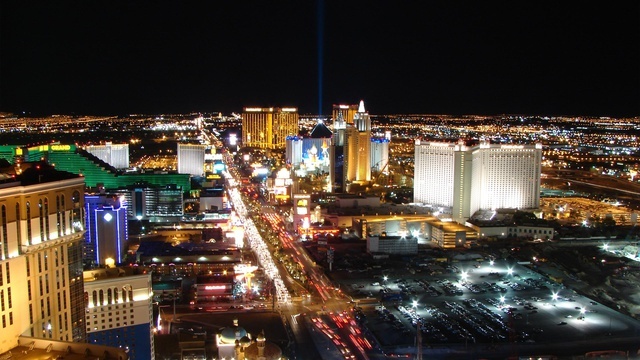 You can choose from a variety of Las Vegas luxury lifestyles with world class amenities. There are two types of high rise condos: residential high rise condos for long term living, and high rise condo hotels for short term rentals. Both of these projects feature fabulous amenities like state of the art work-out facilities, conference centers, valet services, maid services, spas, gourmet dining and resort style pools. The City Center is a mixed use development on 76 acres in the heart of the Las Vegas Strip between the Bellagio Resort Hotel and Casino and the Monte Carlo. City Center is a $9+-billion, 16,797,000 square feet, massive urban complex with casino, hotels, residential condo hotels, over 500,000 square feet of fabulous boutiques, clubs, modern sculptures and installations by world famous artists, fire station, theaters, shops, galleries and gourmet restaurants for residents to choose from, truly allowing them to live, play and work without ever leaving the development. It is the largest privately funded by MGM Resorts International and Dubai World construction project in the history of the United States. 61-story ARIA Resort & Casino is in the center of this project. It features 4,004 rooms, designed by world renowned architect Cesar Pelli and a 150,000 sq ft (14,000 m2) casino. There are no residential condos in the Aria, so there are no units for sale, but all the residents from other City Center high rises can enjoy all the amenities in the Aria. ARIA Resort & Casino has also received the highest level of recognition, 5 Green Keys, from the Green Key Eco-Rating Program, the largest international program evaluating sustainable hotel operations. Environmental sustainability, or going green, is about conserving today to protect tomorrow. Cosmopolitan is 61 stories building with approximately 2,600 units. Unit prices range from 190,000 to 3.5 million. The Cosmopolitan offers studio units and one bedroom condo units. Condo sizes range from just under 600 square feet up to 900 square feet. Units can be combined for more space. A "combo" unit can consist of a one bedroom and studio or two studio units together. All Cosmopolitan units have their own 100 square foot balconies and corner units have 400 square foot balconies. Cosmopolitan also offers 11 Lanai units. Lanai units are two story loft suites of approximately 755 square feet with balconies and direct access out to the luxurious pool deck area. Penthouses in the Cosmopolitan range from approximately 2069 square feet. There are six type of the luxurious units: terrace studio units, terrace one-bedroom suits, terrace one-bedroom premium suits, terrace suits, wraparound terrace suits and city rooms. In addition Cosmopolitan Five-Star services include 24 hour doorman, valet and concierge service, storage spaces, business center, media room, conference facilities, Nevada's largest 50,000 square foot fitness facility and spa, 70,000-square-foot casino, more than 300,000-square-feet of retail and restaurant space, 150,000 sq. ft. of convention space and 1800 seat theatre. Also, it features a 3,000 car enclosed and secured underground garage. The Harmon Hotel and Residence is designed by Foster and Partners, and will be operated by Andrew Sassoon's Light Group, one of the leading nightclub and bar management companies in the country. 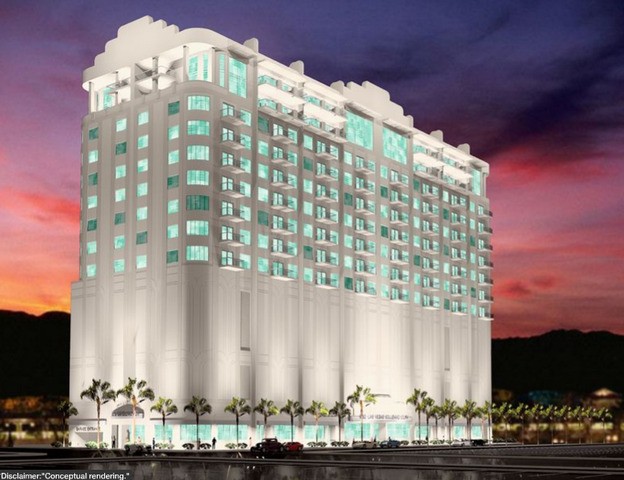 The Harmon Hotel will be a 400-room non-gaming boutique hotel. Originally set to be 49 stories, it was cut to 25 stories after building defects were discovered. The top 21 floors are dedicated to condominium residences. It is estimated to be completed in late 2010, however no official opening date has been set. The City Center Las Vegas Harmon Hotel offers exclusive, private, and comfortable living. Models include a studio, one and two bedrooms, and penthouses. Each room is unique, spacious and offers stylish and fashionable design elements. These luxury units start around 500k and range from 800 to 4,200 square feet. The Harmon Hotel and Residence will offer the highest standard of services and luxurious amenities for guests and residents. Residents have full access to all hotel amenities including a private lounge in the lobby, dining, the luxurious supreme spa with views of the Las Vegas strip, a pool deck perched 100 feet above the Strip, fitness center, a world renowned hair salon, conference and meeting rooms, concierge service, valet parking, 24 hour security and much more. The Mandarin Oriental Hotel and Residences was designed by KPF architects in collaboration with top interior designer Adam Tihany who is noted for extraordinary projects world-wide. Located on the south side of the MGM City Center project and fronting the famed Las Vegas Strip, the Mandarin Oriental owners are offered custom-made services and amenities to complement their lifestyle - condominium owners are treated as permanent guests. The 47 story world class building offers 227 luxury residential units on its top floors and 392 hotel rooms. Residential units are most prestigious and most costly of the MGM project's four residential elements. Built above the hotel?s 392 rooms, the residences range from 1,000-square-foot, one-bedroom units to 4,000-square-foot, three-bedroom penthouses. Prices range from $1.1 million to about $7 million. All of the units, whether purchased empty or with a design package, come with hardwood floors, pre-chosen bathroom fixtures and stainless steel kitchen appliances, including ovens, microwaves, stovetops and full-sized refrigerators. The bedrooms have walk-in closets off of their bathrooms and views of the Las Vegas Valley from the 24th floor and higher. Residents have the option of purchasing their condo fully furnished for an additional $100,000 and up, depending on the size of the unit. Buyers are paying for exclusivity. There are 42 penthouses on Mandarin Oriental?s top seven floors. Residences have their own entrance and elevators that is separate from the hotel guests? entrance. In addition to the million-dollar-plus price tag, residents pay a home owners association fee of $1,700 to $2,000 a month, which includes use of Mandarin Oriental?s amenities, such as the hotel?s pool with cabanas, modern gym with a yoga studio, a beauty salon, fitness facilities and a concierge service dedicated to residents. Vdara is a 57 story luxury Condo Hotel with approximately 1543 residences. There are seven type of the luxurious units: Deluxe suite, Vdara suite, City suite, Panoramic suite, Hospitality suite, one-bedroom or two-bedroom Penthouses and one-bedroom or two-bedroom 2 story penthouses. Deluxe sized hair & body care amenities by Aveda? Luxurious oversized units feature understated decor, wide open floor plans, floor to ceiling walls of glass. Custom furnishings, superior amenities and a fully equipped gourmet kitchen is the perfect retreat. Condo unit sizes range from just from 600 square feet up to 3000 square feet. Most of them have spectacular views of the city or Bellagio Fountains. Prices in Vdara start from 300,000 to 5 million. The Veer Towers are twin 37-story towers with 674 condominium units. The Veer towers lean in opposite directions 4.6 degrees from the center. It is the only one all-residential development at City Center. The towers are the creation of noted German architect Helmut Jahn, known for sleek, ultramodern exteriors and unusual shapes. The building's surface features horizontal metal blades that slowly change color during the day and that shade floor-to-ceiling windows from the burning Las Vegas heat. The Veer Towers condos for sale at City Center have the best value for an ultra-high-end contemporary lifestyle. Luxury units feature elegant interiors in three finishing schemes - earthy, ethereal and transcendent. The interiors boast sliding screens between the living areas and bedroom, high end flooring, plush carpeting, stackable washer and dryer. The kitchen features European style wall-hung cabinets, solid surface countertops, stainless steel appliances, designer kitchen faucet, custom glass backsplash and much more. Residential options include studios; deluxe studios; one-, two- and three-bedroom flats; and penthouses. The units range in size from 500 to 3,300 square feet and cost between $348,000 and about $2 million, depending on the size and features of the unit. Turnkey interior packages are available, where potential members can move in with only their toothbrush, if desired. Veer Tower condos are purely residential, boasting Bellagio Fountain Views, but my favorite view is south, overlooking the Mandarin and the City Center Fine Art Collection or the Aria Water Wall in the very center of Las Vegas City Center. This high rise has the best amenities that Las Vegas can offer ? a rooftop pool with unequaled views of Las Vegas, hot tub, sun deck and bar for outdoor entertaining, fitness center with men's and women's steam rooms and saunas, a recreational room, private boardroom and business center, mail room, bike storage, residential valet, concierge service, and 24 hour security. In addition Veer is also part of the City Center public Fine Art Collection, which features the talents of world-renowned artists, such as Richard Long. Planet Hollywood Towers by Westgate is a vacation ownership resort that is fully integrated into a complete casino and entertainment complex, directly on the world-famous Las Vegas Strip. Westgate Resorts? family-friendly properties feature a wide variety of accommodation choices to suit any budget, ranging from cozy studios to spacious four-bedroom suites. There are a total of 1200 units in the PH Westage Towers'. The residences range from 385 square feet to 1035 square feet. Resale units range from $686,000 to $6,900,000! The top five stories of the tower consist of 40 luxury penthouse units. Penthouse units range in size from 4,000 to 12,000 square feet and sells for millions of dollars. Association fees are graduated on the size of the unit and are payable in monthly installments that range from $607 to $5,600 per month. Units feature custom designed interior furnishings that include a state of art home theater, LCD HD televisions, marble-accented bathrooms, relaxing whirlpool tubs with separate shower. Guests will find living areas with sleeper sofas, private balconies or patios over viewing famous Las Vegas Strip. Each condominium holds surround-sound system, floor to -ceiling windows, wireless internet, dual-line telephones, Cable and on-demand movies. The full kitchen with high-end stainless steel appliances will give travelers a hint of home, while creating a sense of celebrity living. PH Westage Towers' offer every amenity you could possibly imagine to make your life complete in this most prestigious area of Las Vegas. The residents enjoy tropical pool, sundeck, 32 private cabanas. Planet Hollywood Spa by Mandara offers signature treatments like the Japanese silk booster facial, and the Hawaiian wave four-handed massage. There is state-of-the-art fitness center with high-tech equipment and with highly skilled staff on hand. Convenient workstations, helpful attendants, and Fed Ex shipping are just a few of the services that make business away from the office a pleasure. 24- hour concierge services you can always relay on. PH Westage Towers' is minutes away from many of the must see attractions, gaming, premier shopping, dining and entertainment. The Signature at MGM Grand is a condo-hotel just a few steps away from the Las Vegas Strip. MGM Grand provides a non-gaming and non-smoking environment. It features three identical 38-story towers consisting of 576 fully furnished units with wide views of the Strip or the mountains. Most of the condo units are privately owned. Unit prices range from 250,000 to more than 2 million. The Signature at MGM Grand offers variety luxurious suites with private balconies, deluxe king beds, oversized marble/granite bathrooms with dual sink vanities, whirlpool spa tubs, bath products from June Jacobs, high-end kitchenette appliances from Sub-Zero and Miele, ultra-thin LCD flat-screen high definition TVs, Wi-Fi internet access, in-room massages (for a fee), newspaper delivery and more. Guests at The Signature at MGM Grand will be pleased by the level of service and amenities The Signature at MGM Grand has to offer. Guests enjoy heated outdoor pools, Jacuzzis, Cabanas, variety of restaurants and lounges. There are meeting rooms, gift shops, business Center, state-of-the-art fitness center. ATM, airport transportation are also available. All three towers, as well as the MGM Grand, are accessible via indoor walkways. With the additional dining, nightlife and entertainment options just a short, one-minute walk away at the neighboring MGM Grand. A stay at The Signature really offers the best of both worlds: luxury living and everything Las Vegas Strip can offer. Palms Place is located on the far west end of the Palms casino property and is connected to the Palms via a 300 foot glass enclosed elevated moving walkway. The architect Jerde known worldwide for its architecture, urban planning and landscape, designed Palms Place and the new hotel tower. The main tower has 702 rooms and suites and contains a 95,000 sq ft casino, a recording studio and a 2,200 seat showroom. Palms Place tower is 49 stories high and has a total of 599 units for sale. Celebrities, major recording artists, prominent sports figures, actors and Palms high rollers are among a few of the owners here. The Palms Hotel and Casino has long been known as one of Las Vegas' "hippest" places to hang out. Palms Place offers fully furnished contemporary condominiums. Prices range from $150,000s to $5 million. Studio condominiums are 600 square feet, one bedroom units are 1,200 square feet, two bedroom units are 1,800 square feet and penthouse suites are 7,000 square feet. The smallest units are perfect for those week-end getaways and penthouse suites with 3 bedrooms, 4.5 baths are perfect for living. The units feature top of the line furnishings, hardwood and marble floors, state-of-art kitchen, twin 42? plasma televisions, king-sized beds with additional queen sleeper sofas, Italian bedding by Mateo. Larger units have multiple balconies with breathtaking views of The World Famous Las Vegas Strip, fireplace in living room, multiple bathrooms, laundry closet with washer and dryer. Palms Place is a condo hotel giving owners the option of placing their units in the rental program when they are not in residence. Owners may elect to offer their condos to the Palms as hotel rentals. Palms Place is connected to the Palms Hotel and Casino by an enclosed, elevated, moving walkway, allowing residents 24-hour access to amenities at the Palms. Amenities include indoor-outdoor swimming pools, 24 hr room service, 24 hr gate security, two story conservatory, business center, valet parking, 24 hr concierge service and much more. The Platinum luxury condominium resort hotel is located at 211 East Flamingo Road, just one block from the Las Vegas Strip within walking distance to Bellagio, Caesars Palace and Paris. So close to world class dining, shopping and entertainment. There are a total of 255 luxury residences in the platinum. One to three bedroom units range from 739 to 1,021 square feet. Prices range from $75,000 to $150,000. Each residence is completely furnished with a 42" wall mounted plasma HDTV and wired for telephone, cable and high-speed Internet access, king-sized beds, resistant carpeting in living room and bedrooms, fireplace with granite surround, designed interior lighting, kitchen with custom cabinetry and stainless steel appliances such as built-in microwave, electric cook top/oven, flatware, dishwasher, refrigerator. Other features include marble countertops, under cabinet countertop lighting, a six jet whirlpool bath, tile floors in the bathroom and washer/dryer in selected suites. Security features include security card entry system, steel coated entry door and automated fire sprinkler systems with central monitoring. The Platinum is a condo hotel giving owners the option of placing their units in the rental program when they are not in residence. Owners may elect to offer their condos to the Platinum as hotel rentals. Amenities in the Platinum include indoor-outdoor swimming pools, eenclosed secure parking, security access systems, resort complex with walk out terraces, state of the art fitness center, spa/treatment center, lush, tropical landscaping, poolside bar and caf�, 5th floor conference center with high-speed Internet access, front entrance with dramatic landscaping and spectacular water feature, welcoming lobby lounge/bar and gift shop, roof terrace and adjoining reception/lounge with dramatic views of mountain sunsets and the lights of Las Vegas. The Trump International Hotel and Tower is located at the cross roads of The Strip and Fashion Show Boulevard and features both non-residential hotel condominiums and residential condominiums. This 5 star Las Vegas hotel is constructed of concrete and glass and adorned with a 24-karat-gold and glass top. All the units are with floor-to-ceiling windows affording exceptional views of the city, the mountains and the glittering Strip. Famous neighbors include Wynn Resort and The Venetian Resort Hotel Casino. The 50 story Trump Tower offer 1,282 hotel-condominium units for sale, including 880 studio and 352 one bedroom suites on the 16th through 59th floors and 50 two and three bedroom penthouse suites on the upper five floors. The units range in size from 533 square feet for a studio up to 3,000 square feet for three bedrooms penthouse. Most of the condo units are privately owned. Unit prices range from 150,000 to more than 2 million. All suites have amazing city views and feature residential touches such as fully equipped European?style kitchens, spacious marble bathrooms with spa tubs and LCD TV with cable. There are six type of g luxurious units: studio units, one-bedroom suits, one-bedroom corner suits, one-bedroom penthouse, two-bedroom penthouse and three- bedroom penthouse. In addition, future plans include the potential to build a second 64 story tower behind the Strip resort across from the Fashion Show Mall. The new tower would have residences ranging in size from 550 sq ft for a studio to 3,000 sq ft for a 3 bedroom. Allure is magnificent 41-story luxury condominium tower on Sahara Avenue overlooking the world famous Las Vegas Strip. The first tower is strictly residential, while the second tower is planned as a hotel/condo with restaurants and other amenities accessible to residents of the first tower. There are 429 luxurious units in the first tower. Allure features 15 different floor plans with a choice of studio, one, two and three bedroom condos for sale. Unit sizes range from 671 up to 6,326 sq ft. for penthouse, with most averaging 1,168 square feet. Prices range from 100,000 to 2.5 million. Additional Allure Five-Star services include 24 hour doorman, valet and concierge service, storage spaces, club room with catering kitchen, business center with Wi-Fi, media room, conference facilities, State of the art fitness facility with individual wellness programs and private exercise room, dry cleaner, a private wine cellar, private library, private outdoor pool area surrounded with 36 private cabanas and much more. Allure is gated community with enclosed and secure parking. Boca Raton at Palm Beach Resort consists four seven story buildings with756 condos for sale. Two story underground secured parking facilities provides residents with convenience and security. Condo sizes start at 585 square feet to over 2,300 square feet for Penthouse. Prices for units range from 60,000 to 470,000. Mantova is a collection of lakeshore villas located in the gated community of South Shore, adjacent to the South Shore Yacht and Beach Club. The buyers can choose from five unique floor plans in the Mantova community from one bedroom up to three bedrooms with den/library in select villas overlooking a courtyard garden and a private nine-hole putting course. All residences come with 10 foot ceilings, upgraded carpeting, wood flooring, laundry area with full-size stacked washer and dryer; and oversized shower in master bathroom. The kitchen features granite countertops, wet bar and high-end stainless steel appliances. All units are pre-wired for cable and high speed internet connection capability. Featuring spectacular views of Lake Las Vegas and the surrounding mountains, most units have balconies and large terraces. The living space ranges from 1,568 square feet to 3,478 square feet. Resale prices range from $160,000 to $995,000. Association Fees are payable in monthly installments of $454 for all units. Because Lake Las Vegas is developed as both a world-class commercial and residential area, you can find practically any and all amenities that you need within the community. There are 2 Luxury hotels and a casino, spas, lake cruises, several private clubs, Marina, sailing, watercrafts rentals, trails and much more. Members can enjoy exclusive amenities such as swimming, fitness, tennis, dining, hiking excursions, group activities, yacht cruises, and weekly events. It's the ultimate club experience at one of the nation's premiere, master-planned communities. Aside from these amenities, Lake Las Vegas also has some top notch-spas, retail stores, restaurants, and recreational areas. Cobblestone streets, piazzas, waterfront restaurants, lakeside boat docks, and specialty boutiques coupled with luxury condominiums on the floors above. Planned in the old Italian architectural style you will feel as though you are always on vacation in your own private retreat. The Metropolis is located just off the Strip overlooking the Wynn Las Vegas Golf Course and minutes from world class shopping. This new project built by renowned developer Randall Davis is Las Vegas' first high-rise condominium project with loft style floor plans. The homes themselves are beautifully designed with more variation in plans than in many of the other buildings. Metropolis offers eighteen floor plans. All residences come with upgraded carpeting, wood flooring, water heater, oversized stone clad shower and generous oversized whirlpool tub in master bath. The kitchen features granite countertops, high-end stainless steel appliances and wine coolers. All homes have superior sound isolation construction between all units. All units are pre-wired for cable or satellite television and high speed internet access. Homes facing the back of the building have balconies and large terraces, those facing the front feature floor to ceiling windows with fantastic views of the mountains by day and breathtaking views of the city and of course the Strip at night. The living space ranges from 1,783 to 4,276 square feet. Resale prices range from $240,000 to $650,000. Association Fees are payable in monthly installments of $852 for all units except the penthouses which have not been established as of yet. The Metropolis amenities include: lush courtyard, concierge service in the lobby, oversized swimming pool and state-of-the-art fitness center. The lobby features marble floors and a front desk attendant. Residents can enjoy private wine cellar with caterer's kitchen for private parties, first class fitness facility with state of the art equipment and much more. Secure parking is on the second and third floors of the building and there is ample guest parking for visiting guests too. Individual storage facilities are also available for sale. The luxury high rise condos at One Queensridge Place are the most exceptional condominiums in Las Vegas. Located at the edge of Summerlin, One Queensridge Place is quiet, private, and elegant, yet still close enough to the excitement of the Las Vegas Strip. One Queensridge Place Condominiums is a two 18 story guard gated towers that consist of 219 each high-rise units with 43 floor plans ranging from 2,014 square feet to 15,691 square feet, priced from $650,000 to $21 Millions for a custom designed Las Vegas penthouse. The lifestyle embodies the ultimate in luxury. These utra luxurious high rises are the finest we have seen in Las Vegas. One Queensridge Place was built for the client who wants a spectacular custom home with all the amenities of condominium living. Unique plans include garden level homes with courtyards and private terraces. The interiors at One Queensridge Place include the finishes of the highest caliber- stone work, mosaic inlays, light fixtures, iron work, and attention to detail that is found in the most luxurious real estate in Las Vegas. Owners are offered a choice of imported stone, granite countertops, custom stained cabinets with decorative moldings, medallion inlays and discerning selection of natural stone bathroom designs, giving each residence the look and feel of customization. Most residences cover the entire width of the building. Penthouse units offer express elevator that opens into a private vestibule. Each home includes an enclosed garage within the parking levels. Most homes offer breathtaking views of glittering Las Vegas strip and surrounding mountains. One Queensridge Place offer every amenity you could possibly imagine to make your life complete in this most prestigious area of Las Vegas. The residents enjoy a wine cellar, wine tasting room with bin storage for each owner and dining area for entertaining. Great Room for socializing with billiards, bar area, table games, fireplaces, caterer's kitchen and large screen TV. There are media room, card room, conference rooms, elegant lobby, retreat room, indoor and outdoor swimming pools and Roman Spa that rivals distinguished health and fitness facilities around the globe. You can enjoy Sun Terrace with outdoor kitchen and barbecue area for private functions and you can always relay on attentive concierge service. Three 1 bedroom guest casitas are also available for guests. One Queensridge Place is world-class living. These residences are really custom homes in the sky. Park Towers is located at Howard Hughes Center. Casino owner Steve Wynn who developed most stunning properties on the Las Vegas Strip such as Mirage, Bellagio and Wynn, teamed with developer Irwin Molasky to create an equally stunning residential property: the off-Strip Park Towers. Park Towers covers 3.5 acres of beautiful landscaping and comprises two elegantly designed 20 story high rise towers situated amongst beautiful arbors and rose gardens with majestic 18th Century urns, statues and fountains, that were imported from France. Park Towers is less than a mile from the Las Vegas Strip. Interstate 15 and U.S. Highway 93/95 provide easy access to other locations in the Las Vegas valley. The city's finest shopping entertainment and elegant restaurants are within walking distance. There are a total of 84 residences in two towers. Every home offers rooms of extraordinary proportions and has entre to the exquisite private spa and health club. Six floor plans range from 2,055 to 6,779 square feet. Each condominium residence was designed with luxury in mind. The d�cor is very upscale; the buyers can expect the finishes of the highest caliber. All units have balconies and offer a breath taking view of the Las Vegas Strip and the surrounding valley. Resale units at Park Towers range from $995,000 to $11,700,000 for the custom penthouses! Association fees are graduated on the size of the unit and are payable in monthly installments that range from $1,700 to $3,200 per month. The complex amenities include richly appointed gardens, a residents' only 7,500 square feet private spa and health club, fitness center with steam rooms, saunas and therapy facilities, beauty salon facilities for hair, makeup and manicure, a climate-controlled wine cellar, providing each resident with a private section to store up to 30 bottles, a Hollywood-style screening room with THX Dolby sound, DirecTV, VCR and DVD players, opulently appointed library with private gardens, fully equipped business center, grand salon with full catering kitchen for up to 100 guests, pool surrounded by cabanas, copulas with whirlpool spa, tennis court, elegant grounds with formal gardens, fountains, trellised gazebos, luxurious plantings and entry fountain, on-site property management and maintenance department, 24 hr uniformed valet, concierge service, front desk, 24 hour access control and video identification, 24 hr security ,access controlled and closed-circuit camera monitored parking. Panorama Towers is a group of luxury high-rise condominiums, located just across the way from MGM City Center with easy access to I-15 and McCarran International Airport. Panorama Tower I has 33 floors and is 420 ft tall. Panorama Tower II has 33 floors and is 420 ft tall. Panorama Tower North has 45 floors is 500 ft tall. All Panorama Towers offer amazing views of the Las Vegas Strip and surrounding valley. 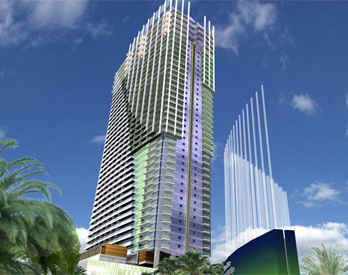 Panorama Towers offer one-, two-, and three-bedroom and penthouse luxury high-rise condo residences. You?ll experience a very open feeling with 10? high ceilings, floor to ceiling windows with spectacular views of the mountains and the Strip. Units range from 733 square feet to 12,940 square feet for custom penthouse in Panorama Towers North. Prices at this Las Vegas luxury high-rise condo community range from the $105,000s to over $7 million for a penthouse suite. Maintenance fees are based on square footage and range from approximately $605 to $5,436 per month. Homes in Panorama Towers feature designer lighting, floor-to-ceiling windows, custom-made cabinetry, kitchen with granite countertops and high-end stainless steel appliances. Most units consist marble floors, marble decorated bathtubs and private balconies. Residents of Panorama Towers enjoy amenities to suit the most refined of tastes, delivered by a courteous and professional staff that anticipates your every need. The complex amenities include state of art fitness center, yoga and Pilates room, man?s and women?s spa with steam rooms, saunas and therapy facilities, massage treatment rooms, fully equipped business center, media room, conference room for special events and meetings. Residents can enjoy heated pool surrounded by cabanas, 24 hr valet, concierge service, front desk, 24 hr security, day time doormen, multi level gated parking garage, dog park. The property will eventually house a retail pavilion with an upscale grocery store, gourmet caf�, high-end dry cleaner, and more. 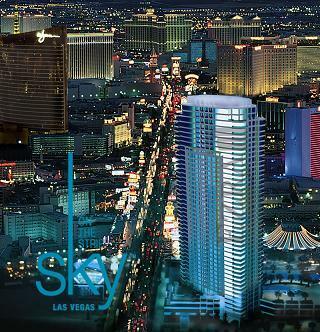 Sky Las Vegas is a 45-story luxury condominium located directly on the Las Vegas strip next to the Sahara resort hotel. Sky Las Vegas has been designed with the luxury buyer in mind. All residences come with upgraded carpeting, wood flooring, oversized shower and tub in master bath. The kitchen features granite countertops and high-end stainless steel appliances. All units are pre-wired for cable or satellite television and high speed internet access. Most units have balconies and large terraces, corner units even feature wrap-around balconies for amazing views. Penthouse units feature spectacular views with rooftop garden patios and private spas. There are 416 units in this building spread over 43 floors. The living space ranges from 778 sq. ft. 1 bedroom/1 bath units to penthouse units with more than 5,184 square feet. Resale prices range from $135,000 to $1,500,000. Maintenance fees are based on square footage and range from approximately $352 to $2,512 per month. The Sky Las Vegas amenities include: spa/fitness center, indoor racquetball, business center with private meeting room, private screening room, dry cleaning and laundry service, billiard room with bar and private social room for private parties and entertaining up to 200 guests. Residents can enjoy a lavish pool area located above the parking garage with poolside cabanas complete with flat screen TV. Sky's luxurious condos include access to an outdoor recreation area with over an acre of pool and garden space complete with putting green, outdoor fire pit, barbeque area, and gated pet-friendly dog run area. Sky also delivers 24 hour valet parking, concierge service, state-of-the-art security including on-site video monitoring and 24-hour guard-gated entrance. The Soho Lofts are located in the Arts district of downtown Las Vegas at the end of the Las Vegas Strip and minutes from world class shopping, freeway access and McCarran international airport. Soho Lofts consists of 1 sixteen stories high building containing 120 units of which 112 will be loft flats, 8 will be 2-story penthouses, and seventy percent of the ground floor will be retail shops and restaurants. Residential units can be delivered as one bedroom with den or two bedroom units. Some of the units have walls to separate the bedrooms, others are left open. North and South facing units will feature balconies with stunning Strip and Freemont Street views. There are seven different floor plans, ranging from 1,277 to 5,206 square feet, with the option of converting part of the loft into bedrooms or offices. Resale units in SoHo lofts range from $120,000 to $900,000. Features include huge picture windows, an 8 foot entry door, 11 foot ceilings, glass-enclosed terraces, sealed concrete floors, whirlpool tubs exposed mechanical systems (ductwork and piping). The kitchen features granite countertops, high-end stainless steel appliances, designer sinks and fixtures, a floating kitchen island and Italian cabinetry by Dellacasa. All units are pre-wired for cable/satellite television and high speed internet access. SoHo Lofts offer many amenities to make your life comfortable. There is a state-of-the-art fitness facility with sauna and spa, a spacious sun lounge and rooftop deck with lap-pool and Jacuzzi. Residents have five floors of enclosed parking garage. Storage units are available too. One more unique feature is a 24 hour door man and concierge service in the lobby. The first floor of Soho has many retail outlets and restaurants. Turnberry Place is 15-acre condo community designed for luxury home buyers of the most refined tastes. Located on Paradise, just North of the Riviera Hotel and South of the Sahara, Turnberry Place is ideally situated in an area of the Las Vegas Strip where new high-end developments will be flourishing over the next several years. 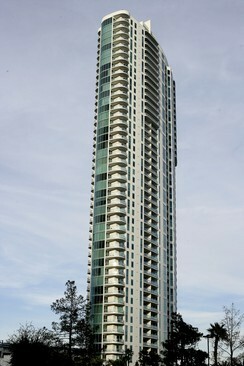 Turnberry Place comprises four towers with its own management. A total of 781 residences are available. There are ten floor plans available ranging from 814 square feet to 8,205 square feet for the penthouse suites with private rooftop pools. Residences were designed with luxury in mind. All units are tastefully appointed with such elegant finishes as Italian marble Jacuzzi whirlpool baths, stunning designer kitchens with granite-topped European cabinetry, and top-of the-line appliances from Sub-Zero and Gaggenau. Many of the units offer private elevator entries, and all feature generously-sized, wrap-around balconies with breath taking view of the Las Vegas Strip and the surrounding valley. Resale units at Turnberry Place range from $159,900 to $9,999,000 for the custom penthouses! Association fees are graduated on the size of the unit and are payable in monthly installments that range from $450 to $2,200 per month. Turnberry Place is minutes away from the airport, near many of the must see attractions, premier shopping, dining and entertainment. In addition, Fontainebleau?Turnberry?s newest $3 billion, 4,000 room hotel-casino resort?being built adjacent to Turnberry Place; owners will find themselves at the center of the Las Vegas action not even leaving community. Turnberry Place offer every amenity you could possibly imagine to make your life complete in this most prestigious ways. Each Tower has its own pool and area for walking dogs. The other complex amenities include: tennis courts, resort-style indoors and outdoors swimming pools, 30,000 square foot European spa, state-of-the-art fitness center with pilates studio, spinning studio and aerobics center, private wine club, wine and cigar room, piano lounge, billiard room, night club, 24-hour guard-gated security, 24- hour concierge services, 24 hour doorman, valet parking, two dining facilities, casual and gourmet, underground parking garage, membership in the Stirling Club, a private club for residents. The Stirling Club provides all residents of Turnberry Place with an exclusive environment for entertainment, relaxation and socializing. Members include renowned individuals from the worlds of business, art and entertainment seeking to meet others with like interests and a mutual passion for refined living. The community owns its own limos, available to residents on a first come first served basis. Turnberry Towers is located just off Paradise Road, one block from the Strip, opposite the Las Vegas Hilton. This residential complex are made up of two 45 stories sparkling, contemporary-style glass towers that promise dramatic views of the surrounding city and Las Vegas Valley. This project was developed by Turnberry Associates, one of America's premier developers of residential-resort properties. Turnberry Towers is a home for 636 residences. Each luxury high-rise condo unit at Turnberry Towers is attractively designed in contemporary style and superbly furnished. The buyers can choose from one, two and three bedroom luxury condos. Penthouses are also available. Units range from 320 square feet to 6,027 square feet. The top 12 floors in each Turnberry Tower house only 3 bedroom condos. Residences at Park Towers range from $135,000 to $3,850,000 for the custom penthouses! Maintenance fees are based on square footage and range from approximately $450 to $950 per month. The developer delivers units in ?designer-ready? condition, allowing you to finish it with your own personal touches and desired level of comfort. Each condominium holds elegant finishes as Snaidero cabinetry, granite countertops, high-end stainless steel appliances, imported Italian marble baths, and whirlpool tubs. All units include large balconies with glass railings and 9 foot ceilings. What sets Turnberry Towers apart is the electronic concierge service. Building Amenities System, a special touch-screen program that connects you with all of Turnberry?s activities and services as well as Las Vegas attractions. Each resident is able to schedule maintenance, order their car from valet, order food, and reserve a tennis court, all with the touch of a button. As a resident of Turnberry Towers, you?ll enjoy the thrills of urban living combined with the privacy, world-class luxuries, and stellar service of the finest hotels and resorts in the world. The community amenities include a 24 hour doorman, 24-hour guard-gated security, 24- hour concierge services, 24 hour doorman, valet parking, state of the art fitness center, 2 lighted tennis courts, fitness center, club room, lush tropical landscaping, large resort style pool with waterfall, spa, sun deck, business center, fully -equipped social and meeting room w/catering services, underground parking garage, two-year membership in the Stirling Club, a private club for owners. In addition Stirling Club, located at Turnberry Place just across the street. The Stirling Club is an exclusive environment for entertainment, relaxation and socializing, where members have access to a host of amenities such as premier dining, a private wine club, a billiards room, and a piano lounge. The Club also offers an upscale spa and salon, where you can enjoy expert skin care, body-soothing treatments, muscle-relaxing massages and hair care from top stylists. Regency Towers Las Vegas located on the grounds of the Las Vegas International Country Club, was one of the first high-rise residential buildings in the area. Built in 1974, the Regency Towers contain some of the city?s most elegant homes. There are a total of 218 units, most of which have views of the Las Vegas Strip and Sunrise Mountain. Condo is available fully furnished or unfurnished. Standard floor plans in Regency Tower range from 584 to 2,208 square feet. There are also 8 customized units ranging from 2,408 to 5,938 square feet. Resale prices range from $75,000 to $599,000. Association fees are based on square footage and range from approximately $289 to $1,057 per month. Most of condo units feature glass-enclosed terraces or balconies, spacious living rooms, upgraded hardwood floors and upgraded carpets. The kitchen features granite countertops with stainless steel appliances. All units are pre-wired for cable/satellite television and high speed internet access. The complex amenities include richly appointed gardens, outdoor BBQ grills, fitness center, sauna and spa facilities, assign parking space, on-site property management and maintenance department, valet parking, concierge service, doorman, two tennis courts, individual storage units are available for additional fee, 24 hr security and much more. Hotels suits are available for visiting guests. Charlie Palmer, C2 Lofts, Club Renaissance, Cielo Vista, Grand, Fountains at Flamingo, Fontainebleau, Echelon, Manhattan, Maxim, Marie Antoinette, Newport Lofts , Loft 5, Las Vegas Central, Juhl, Park Avenue, Plaza Las Vegas, Promenada, The District, ONE Las Vegas, Simayof, Stanhi, Sullivan Square, Streamline Tower, Stephanie Village, Verge, Vegas Grand.